Update (2018/11/10): The addon I am developing, BakeMyScan, is now hosted on bakemyscan.org. I also modified a lot of the python code while improving the addon, but this had the side-effect of making almost every link in this article obsolete… I still hope you’ll enjoy the read! In this post I’ll therefore detail the workflow and tools I use to create such collections of assets – using Python in Blender! And Sketchfab offers all of us a great resource: plenty of freely downloadable models that you can actually inspect before downloading, and re-use under the terms of Creative-Commons licenses, the most common being the CC-attribution. In a few words: give credit and enjoy! And there you go: plenty of high quality 3D models to play with, whatever your application is! I guess that everyone here knows – or has their own definition of – what lowpoly means. LOW-POLY. A model made from a low number of polygons. Although to me lowpoly mostly characterizes an art-style – think bright colors and sharp edges, like on the wonderful model above from tzeshi – I’ll define a lowpoly asset in the context of 3D scanning as a realistic 3D model made from 100 to 5,000 triangles. That satisfies most of my needs, my criteria being based on performance as I use such assets as particles in Blender, and as “game assets” in Unreal Engine, Unity 3D or in WebGL apps. Those models are often associated with at least an albedo map and a normal map, the latter being fundamental, as it can give to a potato-shaped blob of 200 triangles the appearance of a highly realistic carved rock! Concerning web technologies, your app will have a lower bandwidth usage and loading time (who wants to wait 15 minutes for an environment asset to load? ), run on less sophisticated computers and more easily on mobile, and you will be allowed a greater complexity for the same “performance budget”. And the advantages are even present for offline renderings in your favorite 3D software, especially for animations where decreasing your polycount can drastically cut down the rendering times (and electricity bill)!! But you all know that of course ;), so let’s move to the workflow I use! After checking the model’s license (to make sure that every model is on CC-attribution or another adequate license) on Sketchfab, I download it and unzip it to a specified directory. I then import the model in Blender and assign its albedo and – if it exists – its normal map to a new material. I usually center the model in my 3D scene, make sure that no rogue elements (disconnected vertices and faces, inside and invisible parts…) persist, and rescale it so that its longest dimension is equal to one Blender unit. Optionally, and in order to smooth out artifacts and obtain a clean surface, which is not obvious with raw scan results, I often remesh the model to a high poly version (around 500k triangles) with mmgs, which you could easily replace on Windows with Meshlab and its backend version, meshlabserver, for instance. Mmgs is a neat little command line tool from the MMG Platform, a suite of open source softwares and libraries for linux and MacOs (sorry Windows users!) used for mesh generation, adaptation, optimization of for Level-set discretization. It relies on the mathematical concept of the Hausdorff distance: instead of fixing a target number of faces, you basically specify the maximal distance you wish to have between the initial model and the remeshed one, and mmgs will do its best to give you a nice surface approximation, either decimating or refining your mesh. On this model for instance, I used a lower Hausdorff distance for the details than the rest of the horse’s body. If you wish to give it a go, you can install the software for linux or Mac from the MMGTools github repository, and install the BakeMyScan add-on to interface it with Blender (as the software usually runs in command line with the uncommon MEDIT .mesh file format). I first estimate the final number of faces I wish my final model to be: a round rock can look convincing at 500 triangles, while a more complex type of model will require more triangles: for the animal skulls embedded above, for instance, I chose to go for 2500 triangles to keep some of the thin details. I then remesh the initial model to a “medium-poly” model (20k to 100k triangles depending on the complexity) with mmgs. Decimate -> Planar: Merge faces separated by an angle under a certain threshold, I usually keep the default value of 5°. Triangulate: Retriangulate the model resulting from the planar decimation, which tends to have strange n-gons (faces with more than 4 edges). Smooth: At this step, the resulting geometry is often stretched, and a few steps of laplacian smoothing help to keep a decent topology and avoid intersecting faces! Decimate -> Ratio: Automatic merge of faces, according to a ratio which I often leave at the default value of 0.8. 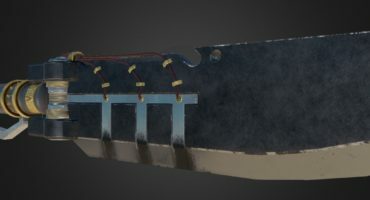 Shrinkwrap: This has the effect of making the current geometry “stick” to the original one, making sure that the previous decimation and smoothing operations did not alter the geometry too much. At each iteration of the above sequence, the mesh is decimated, by a variable factor. I therefore have to repeat these steps until the last iteration lowers the number of faces under the threshold I set. I then cancel the last iteration, and let Blender do a final decimation with the Decimate -> Ratio modifier, in order to obtain the “nearly correct” number of faces. Now that my target number of faces is reached, I unwrap the final lowpoly model with Smart UV unwrap, Blender automatic (and dirty) UV unwrapper. I finally bake the normals from the original model – or the high resolution model previously created by mmgs – to the newly created model, as well as the albedo map. Time to directly export to Sketchfab (Blender has an addon for this), or as I usually do to export the model as a .fbx or .obj file (understood by game engines and most 3D software). I usually export the textures to JPEG format, which offers a nice compression and a lower file-size, in exchange for a slight loss of quality, especially visible on normal maps. Many parts of this section are quite “advanced” regarding command-line usage, sorry in advance for the technical bits! Also, the following scripts are still in an unstable “Work in Progress” state. Their behavior is not consistent and although you might get lucky on the majority of the models you try to play with, plenty of bugs and unexpected errors may – and will – happen. Blender has a Python API available, which basically allows automation of most, if not all, of the tasks we manually do by selecting objects, dragging the mouse, clicking the mouse, pressing keys… Who still does that in 2018!? In a few words, when you execute an action manually in Blender, you’ll see a line of code appear in the “Info” area, which you’ll find by dragging the main menu toolbar down or selecting “Info” in the area selector (like when switching between 3D view and Node Editor or UV/Image editor). Copy and paste this line into the python console and you’ll see the action you executed repeated. Paste it into a new file of the text editor and you’ll be creating a script. Paste other lines in, tweak them, and you’ll be a programmer! You’ll find all the information required to start scripting in this Blender manual section, which will provide you with a nice quickstart as well as the full API documentation! This add-on should work correctly for Blender 2.79 (provided you follow the installation and usage instructions). Note that it could work for older versions, but was untested and you know the deal: use at your own risk! If you tried to use it and found a bug or a missing (and somewhat “basic”) feature, please create a new issue on github, and if you have tweaked and improved it, of course feel free to fork the repository and create a new pull request so that I can add your modifications! Writing this add-on came with yet another advantage: each button available in Blender UI corresponds to a function I wrote, which can be used like any other from the Blender python API. And as this API can be used without even opening Blender (by using Blender in background mode from the terminal), I wrote a higher level “wrapper” script incorporating my add-on functions and available here, which can be executed by Blender. Equipped with an “automatic” and DIY way to create a lowpoly asset from a high resolution scan, without even opening Blender, the last step consists of treating multiple models in one shot. Concerning Sketchfab models, I simply wrote a python program (available here), which takes as input a directory containing directories, each of them containing a 3D model and – if they exist – associated albedo and normal texture maps. This script runs the previous Blender script on all available models, and exports everything as .fbx 3d models and jpeg images to a common location on my computer. The only task left is to import everything in an orderly fashion, and export to Sketchfab. And there you have it. A nice pack of lowpoly assets made from 3D scans! All the documentation associated to those python scripts is available on this page. In order to further ease the automation of the tasks, I tried my hand at writing yet another script which takes as input the URL of a Sketchfab model or collection, and proceeds to automatically download the corresponding model(s). This script uses the Sketchfab API to retrieve models’ information from a collection and store them in a credits.md file (easing the “attribution” part in “CC-attribution”). It also uses Python bindings for a browser-automation tool called Selenium (used by web developers to automatically test their website) which automates the part of opening a web browser, navigating to the model page and hitting the download button (useful for collections). You’ll find the documentation for this script here. I can’t guarantee that everything will work fine for you, but I can try to help you if you create an issue on github. So here you go, this is how I create some high quality lowpoly assets from great models found on Sketchfab! I still have to experiment with the photogrammetry process for various types of objects, but so far I’ve found that mixing colmap and openmvs (as explained by Dr. Peter L. Falkingham in this Sketchfab blog post) gives great results! The next step for me would be to create a cheap automated turntable based on Arduino and Raspberry PI hardware, but I guess that this will be for another story! 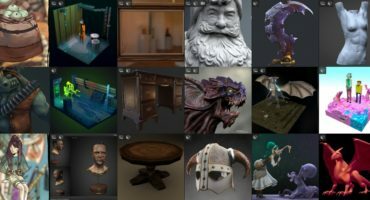 Finally, thank you to the Sketchfab team for creating and maintaining such a badass 3D website, with a special shout-out to Thomas Flynn who invited me to write this post as well as Abby Crawford for the patience and corrections! But more importantly, a huge THANK YOU to all of the Sketchfab users out there who upload amazing models, and make them available for anyone to re-use. You guys rock! PS: I’m not much of a social networks guy, but do not hesitate to follow me on Sketchfab or on github! Loïc, I wanted to take a moment to thank you for an outstanding blog post here. Really useful and explained so well. You are one of the reasons that I love this community of folks so much; everyone is just trying to help everyone get better so that we can push the boundaries of what we can do. Thank you! One of the main factors I tried to explain this process in details was exactly because I appreciate the spirit of Sketchfab’s community: as you said, a bunch of people eager to help and share tricks… What to ask for more! How to bake proper albedo map from high-poly to low-poly? * You don’t care about using blender: I guess that every 3D editor has its own baking tools, and it appears that Substance Painter, Marmoset and xNormal do a great job at baking maps. Note that the first two are not free, and you’ll have to consult tutorials to use them. Sorry I can’t help you more on this. * Finally, if the albedo map you want to bake from the high poly model was created proceduraly by using nodes in Cycles ( if you have no clue of what this sentence means, it is most probably not the case 😉 ), then you can use this add-on. You’ll have to make sure that the high poly object’s material uses a “Principled BSDF” node as a shader (and not a “Diffuse” one). Then in the 3D view just select your high poly object first, then the lowpoly one, and hit the button called “Bake textures” in the BakeMyScan add-on panel. Select a directory to export your texture to in the file selector, as well as the texture resolution in the bottom left part of the screen. And only check the “albedo” option. Fantastic! Shrinkwrap was the step i was missing in my attempts. I have a growing number of photogrammetry objects i plan to convert to low poly. You used MMG for your initial remesh step. What is the advantage of MMG over Blender’s remesh modifier? Also I’ve been checking for a clean manifold using the 3D-Printing addon. Is that overkill? Hi Oke, and thanks for your interest! And honestly, in the process I described in this post, using MMG as an initial remesh has no particular advantage over the remesh modifier, as the geometry is altered a lot in the following steps. However, I find it very useful as a “one-step” triangular remesher: the input the program takes is the Hausdorff distance, which is directly linked to the quality of the surface representation (instead of just a ratio as in the decimate modifier or a voxel resolution as in the remesh modifier). Plus you can specify “advanced” options when using it in command line (which is its main purpose) such as the ratio between different edges, the minimal and maximal edge sizes or a scalar map to specify the size of edges on your object. Let me know if you’d like more info on this matter, I could write an add-on (and guarantee it to work fine this time) for this sole purpose if some people seem interested to use it for CG. And aiming for “manifoldness” really depends on your usage scenario, and most of the times you don’t necessarily need a manifold mesh for CG, as opposed to most numerical simulation codes for instance. Also, the 3D print add-on “make manifold” operator linked with modifiers such as shrinkwrap and remesh can sometimes produce ugly meshes if your input object is “too far from manifold”, and takes a really long time to do so. My advice would be to only go for a manifold model if you are 100% sure you need a watertight and non-intersecting model. Otherwise, I indeed think that it is overkill. Let me know if you need help or manage to use the scripts, I’d be glad to see some results ! If you have tried to use it, make sure to let me know what you think, I’d love to have some feedback as I’m convinced that this little addon can get bigger and better! Hello, your work is insanely good, congratulations ! Your work made my life so easyer !